The PGA Academy exists to provide a pathway for individuals that wish to become a fully qualified PGA Professional. The PGA Trainee Program is ideal both male and female golfers who have a passion for a career in golf. PGA Trainees work alongside fully qualified PGA members and receive practical work experience and on-the-job training at approved golf facilities around the country. In addition to developing real skills for the workplace, PGA Trainees also receive nationally accredited qualifications in a variety of vocational disciplines. "My time spent as a Trainee Professional and the journey that I have been on through the PGA Academy has been a truly unique experience. Throughout the three years I spent in the programme I've learnt more than I could have ever imagined, I've reached goals that seemed like dreams and met some of the most amazing and interesting people that I have ever had the pleasure to spend time with and learn from. I feel privileged and honoured to have been able to take part and complete the traineeship and incredibly proud to call myself a full member of the PGA, the traineeship has given me the skills and qualification to launch my career in golf and I'm excited to see what the future has in store”. Applications have now closed for the 2019 program. Studies in the Trainee Program are a combination of on-the-job training, block release training schools, distance and on-line education. Coaching - knowledge and skills for golf coaching, leading to the highest level of coach accreditation in golf. Game Development - strategies and skills to actively grow participation and enjoyment of the sport of golf. Small Business - strategic and operational skills for successfully operating business in the golf industry. Management - skills and strategies relating to planning, organising and leading a golf club or golf organisation. Two training schools are held during each year of training covering theoretical assignments and practical examinations to assess the progress of the trainee. Comprehensive Workplace First Aid Certificate - a two day course - delivered by Red Cross or St. Johns. Class A or B Rules Badge from the New Zealand Golf Association. Seminars and examinations are conducted by District Golf Associations. Some members also transition into golf management or other industry related roles and seek additional skills through the completion of continuing education programs or external content. Professional tournament play is an integral component of the PGA Trainee Program. Throughout the program, Trainees are required to complete in a number of professional events to ensure they retain a professional playing standard. A minimum of twenty (20) rounds per year is used to calculate an adjusted playing average and successful completion of the playing requirement is contingent on achieving the required average in each of three (3) separate playing periods. Be a New Zealand citizen or permanent resident with the ability to work unrestricted for the duration of the program. Attend an interview and aptitude assessment day with representatives of the Academy and provide evidence in support of their application. 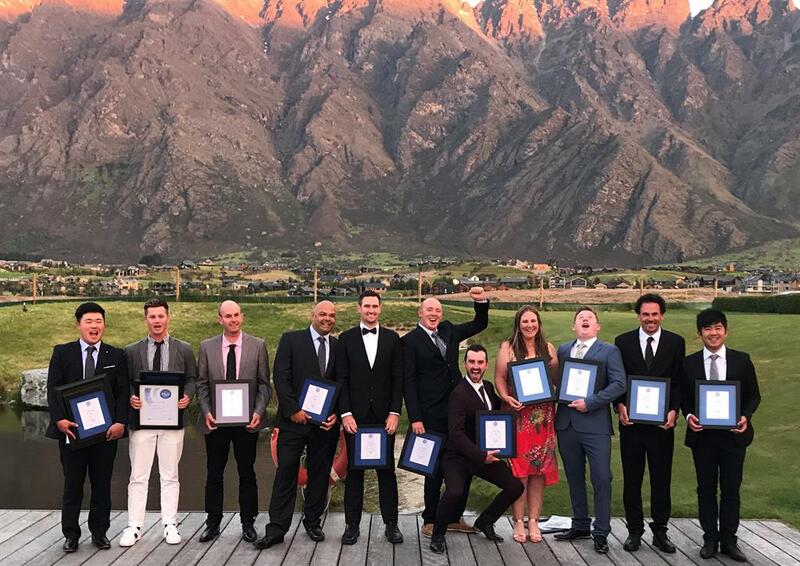 "Regular coaching and advice from a PGA Professional - whether on their game or equipment - is one of the most beneficial things any golfer can do to improve not only their game, but also their enjoyment of golf"
The 2018 awards dinner took place at Jacks Point in Queenstown to celebrate the close of a fantastic year. Attended by PGA trainee family and friends, this year we had 11 outstanding trainees graduate into full membership of the PGA.